Reine, May 12, 2014 in Music. Several years ago, I went to a Nine Inch Nails gig in Stockholm, at the same time as my own world collapsed around me. Trent hit a special note and I was moved to tears, transfixed by the flame. Two years later I stood alone in the rain, surrounded by thousands, while Trent teared away at his equipment in the forest of Arvika. Reine, December 21, 2009 in Music. 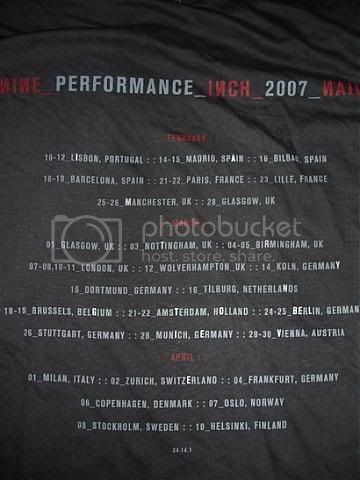 2009 must have been one of the busiest concert years ever. Perhaps in some way due to the decrease in record sales which forces the artists to hit the roads. Regardless of the reason I estimate that I visited about 80 gigs during the year, and here are some of the highlights. Reine, April 09, 2007 in Music. I just got back from a Nine Inch Nails concert in Stockholm. It was so great I started to cry. But even more interesting than the concert is the marketing hype surrounding this tour. It all started with letters in concert t-shirts from the current tour, spelling out a domain name: iamtryingtobelieve.com. A visit to this odd site introduces the mystical substance “parepin”, a fictional additive supposedly added to the water in the future.